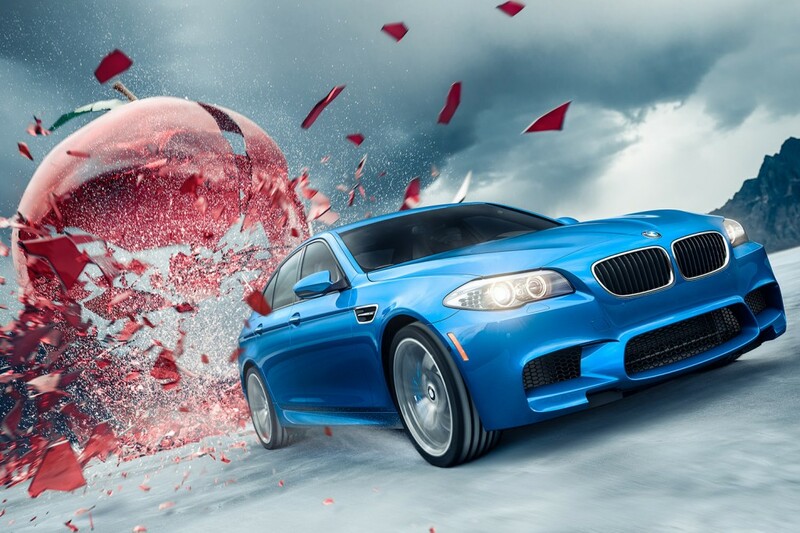 What does it take to turn a blue BMW M5 into a bullet? A little of this, and a little of that, but mostly it takes a team of talented individuals with a dream and the know-how. 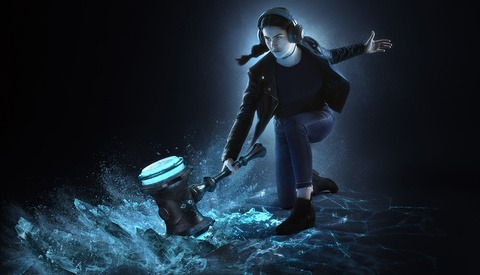 With a limitless imagination, impeccable understanding of light and meticulous attention to detail, photographer/director Marek Glaser and Big Block digital productions took the imaginary and made it reality. BMW had a lofty and somewhat amorphous dream. 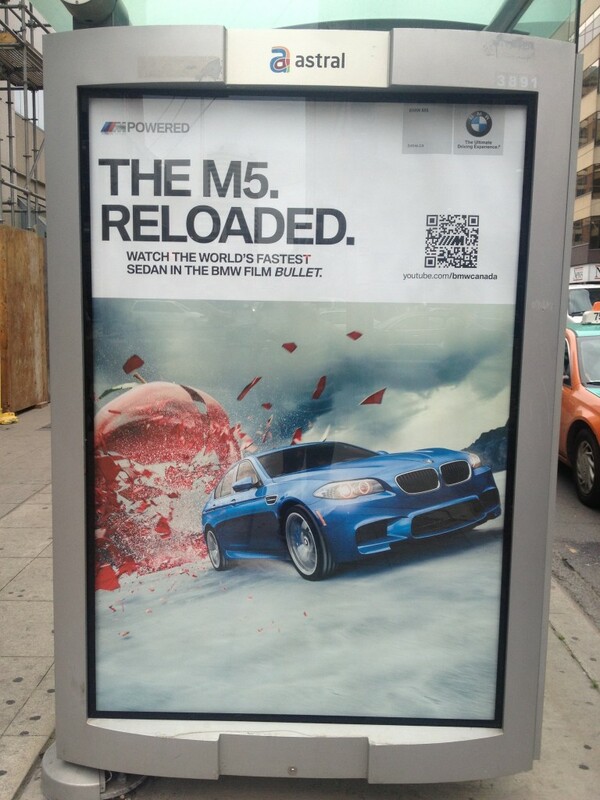 They came to Glaser and Big Block with the idea to take their BMW M5 and turn it into a bullet. They wanted to use high-speed cameras to capture the M5 crashing through an enormous glass apple with such speed that the M5 would be long gone before all the broken shards hit the ground. In a theoretical magic dream world and with breakaway glass and the right camera angles, this seemed possible. In reality, it would cause some pretty gnarly destruction. 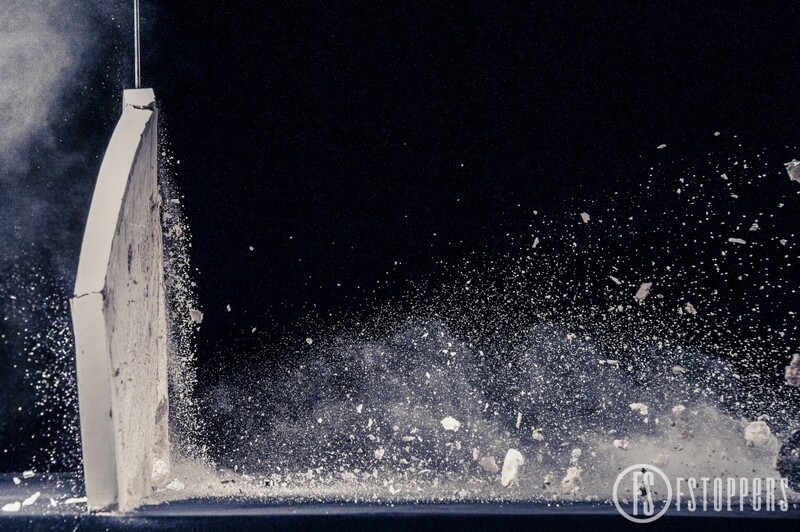 So how did Big Block make the glass apple break along with two other high-speed stunts? They did it with a mix of immensely detailed computer generated imagery (CGI) mixed with actual footage shot in extreme slow motion. Big Block wanted to give BMW exactly what they wanted and more. 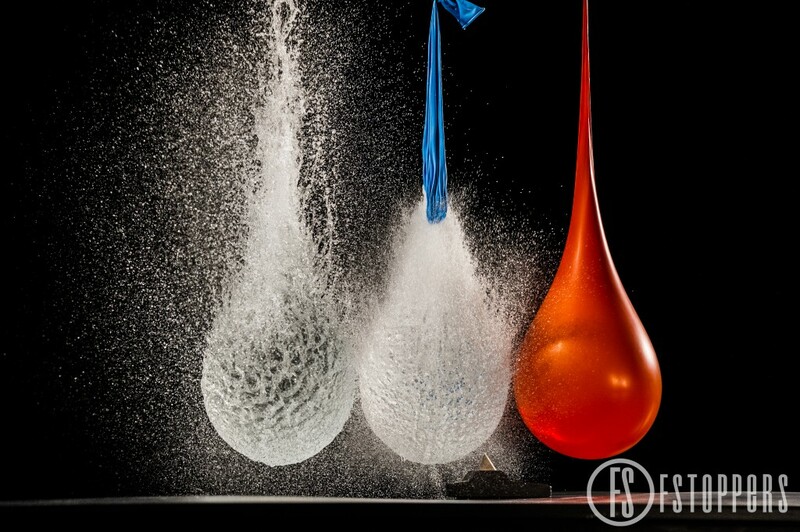 In addition to the shattering apple, Glaser’s team also wanted to add three bursting water balloons and a crumbling target. Unfortunately, the laws of physics decided to stand in their way. No matter. 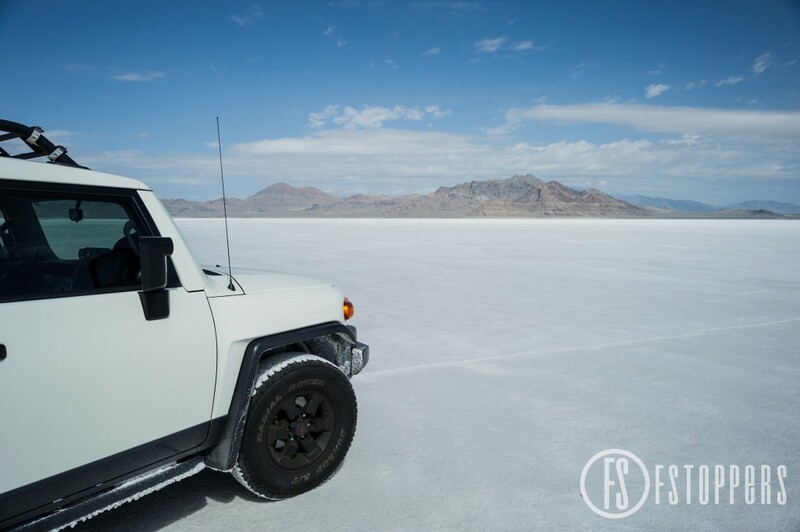 Big Block wanted the commercial to depict the BMW driving at preposterous speeds out in the Utah Bonneville Salt Flats, a desolate flatland of glaring white salt and blistering heat. What better place to stage a crazy stunt? 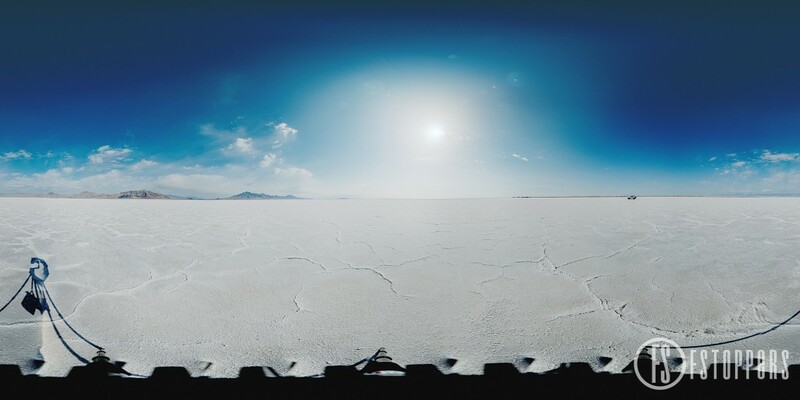 In order to make sure that everything computer generated looked as real as the computer screen you are staring into right now, Glaser traveled to the Salt Flats with the D3S and a new D800 to record true high dynamic range (HDR) 360-degree photography. This kind of HDR photography is not the kind you are probably thinking it is. This is not exposure fusion, where you take multiple exposures and combine them into one image. This is true HDR with a 32bit color file and all the light levels captured in one image. This would provide all the reflections, lighting and basis for the entire computer generated environment that would be created virtually. Click the images below to view larger. Once Glaser and the team at Big Block had the background made, he took everything back to the studio and split the task into two parts: the real and the virtual. 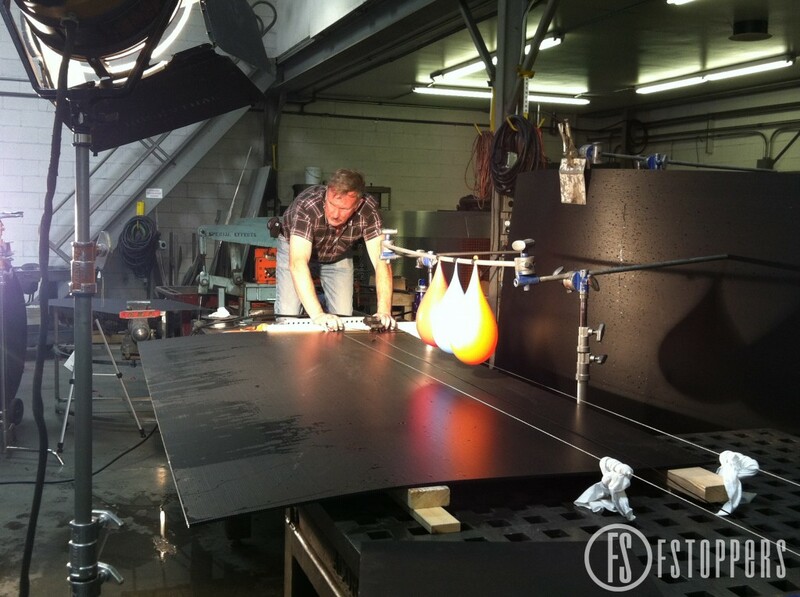 One team would be tasked with creating all the actual special effects that would be integrated into the commercial. This includes the popping water balloons, the exploding apple, and the crumbling target. They would also record the actual sound the BMW makes when it revs into gear. The digital team would be tasked with recreating the BMW M5 virtually using the CAD blueprints provided by the manufacturer. 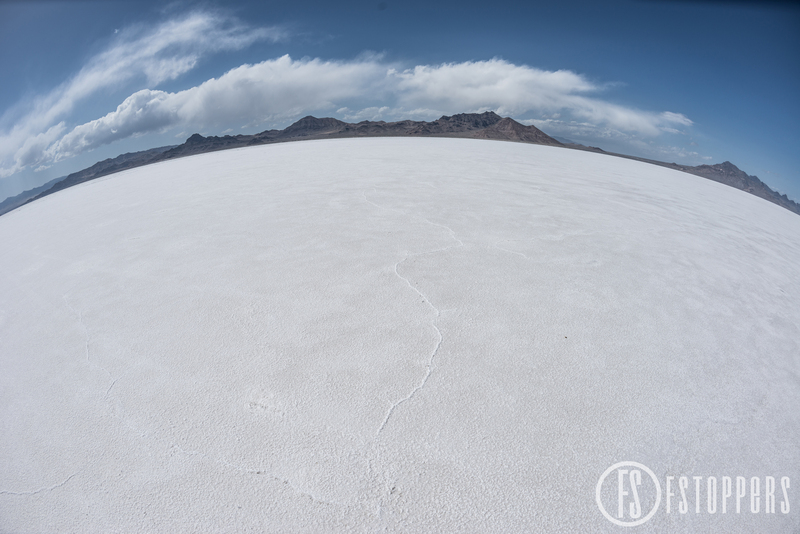 They would also need to build the entire environment using the footage that Glaser captured in the Salt Flats. 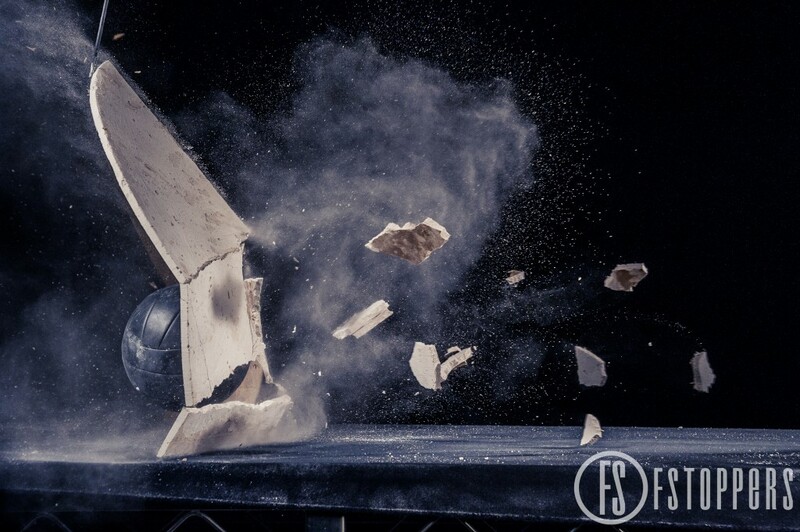 When he first heard about the idea of the shoot, Glaser took his Nikon1 V1, a Hollywood breakaway glass orb, and a golf club (3 iron to be precise) into a spare room to run a test. 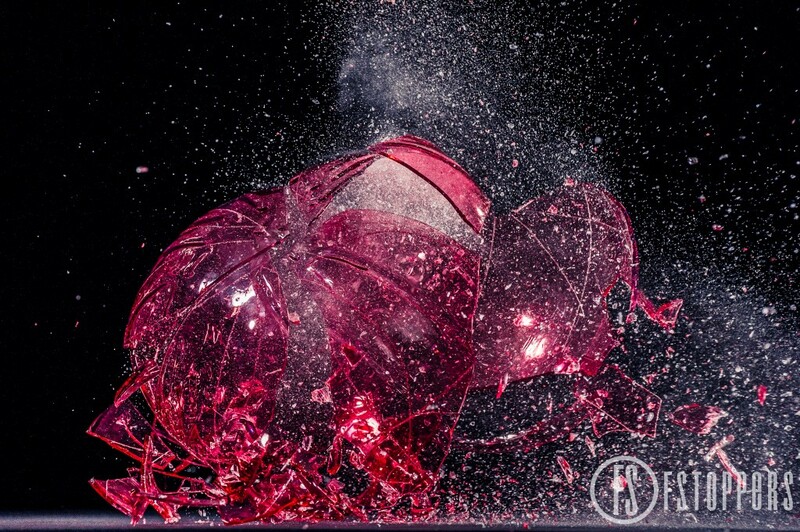 Glaser wanted to get an idea of how glass reacted to the extreme circumstance of being smashed at a great speed. Watching how the orb reacted allowed Glaser to see the physics of the collision. 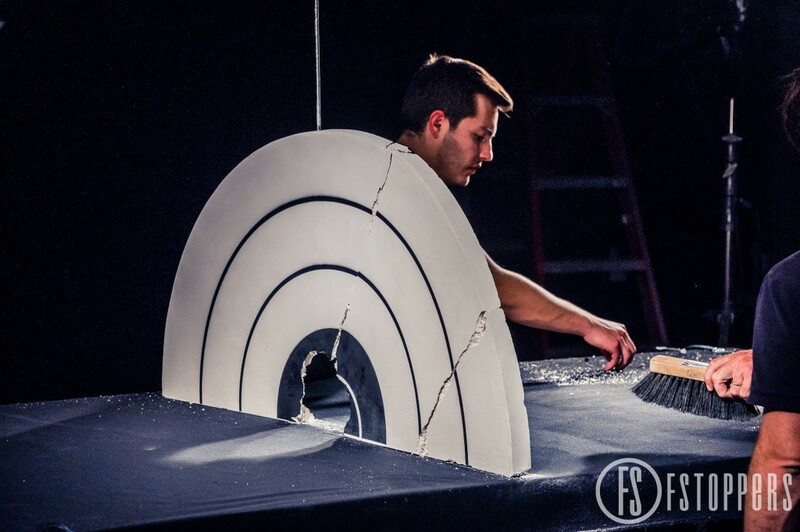 With those results in mind, he was able to better sculpt the idea of the studio shoot’s lighting and physics that would mimic a car crashing through glass. The rig that Glaser’s team built is every Myth-Buster-fan’s dream: a cannon set at one end of a long work table would fire a projectile at extremely high speeds to crash through whatever Glaser’s team put in front of it. 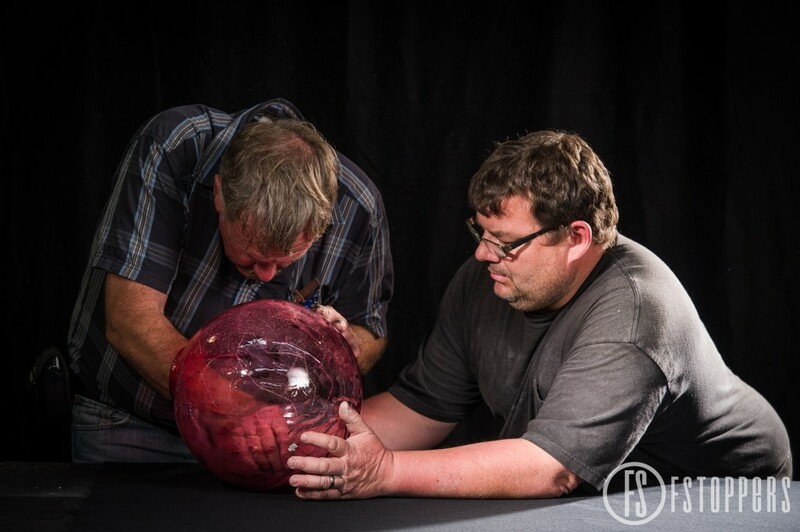 In this case, they took a red “sugar glass” orb and accelerated a black golf ball straight through it. The lighting was pretty simple. 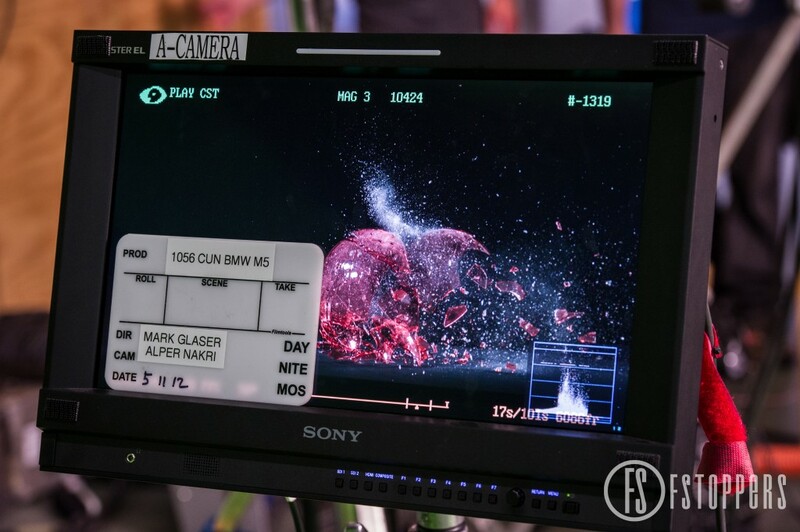 Glaser’s team rigged two 20K Arri lights stage-lighting style on either end of the table. Immense power was needed in order for every frame to be properly exposed on the extreme high speed Phantom Flex camera with which they were shooting. The effects were shot at 1200 FPS. The rig for popping the balloons was slightly more complicated. Since the car wouldn’t survive impact with a body of water Glaser decided that the BMWs shark fin antenna would slice into the fragility of the stretched out rubber. 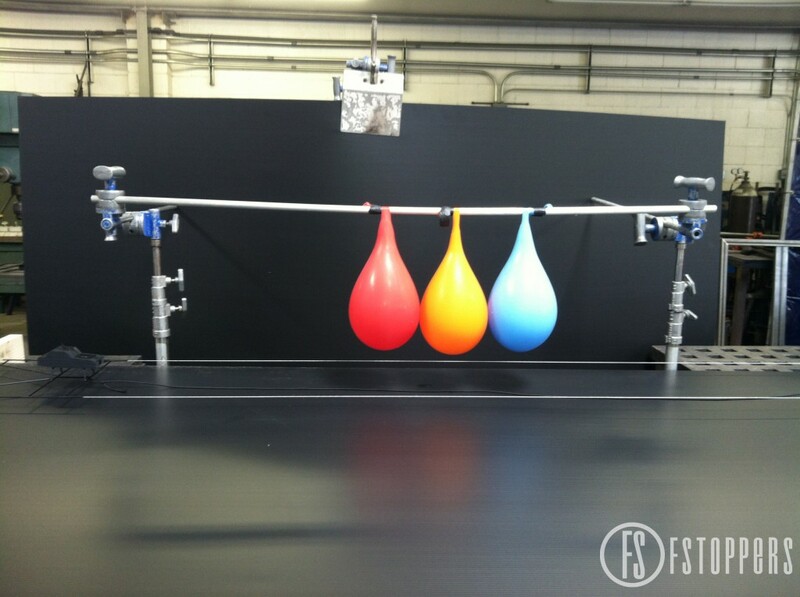 The popping had to start at the bottom of each of the real balloons, causing them to rupture. To do this, the team built a simple rig consisting of a tiny car with a sharp fin attached to its roof, a straw, and a sturdy wire. The straw was attached to the bottom of the model car and the wire strung through the straw to act as a track. The lighting was the same as in the apple shot, just adjusted for a slightly wider subject matter. The crew then launched the car down the track, directly underneath the balloons to mimic the effect that Glaser had imagined. The results speak for themselves. The final step of shooting actual footage involved crashing the car through a half circle target. 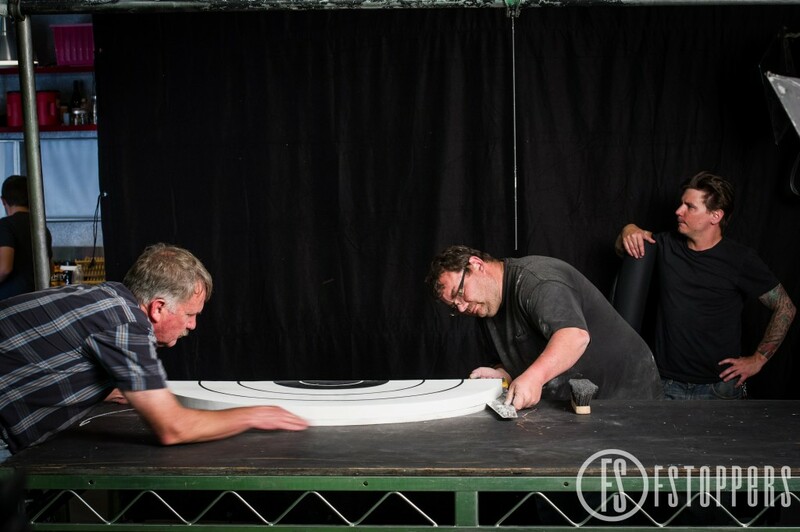 If this were to be attempted in the real world, no matter what material Glaser’s team would have used to recreate the target, every situation would have been extremely expensive and risked damaging the vehicle. On a small scale and in the studio, the situation was much easier to control. Glaser’s team built the target out of pyrocell, a material that held its shape well until anything forceful made contact with it. At that point, it crumbled like sawdust. 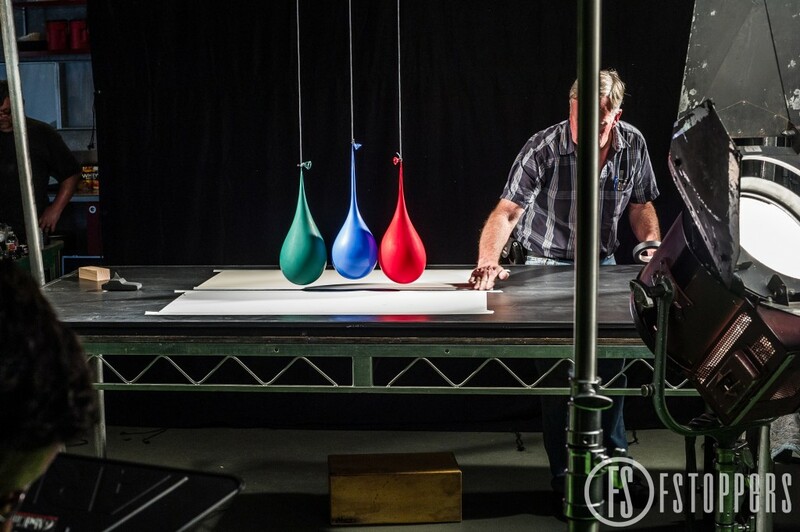 The team used the same cannon rig that they employed for shooting the apple and the lighting was also identical. 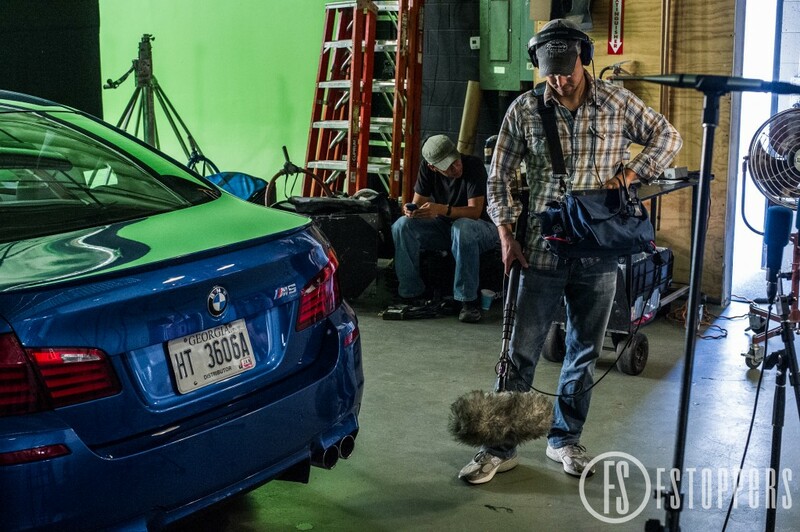 Glaser’s team also recorded audio of the BMW M5 revving up and shifting into gear, important for believable sound in the commercial. With all the actual video footage in the bag, Glaser’s virtual team took over and went into action. 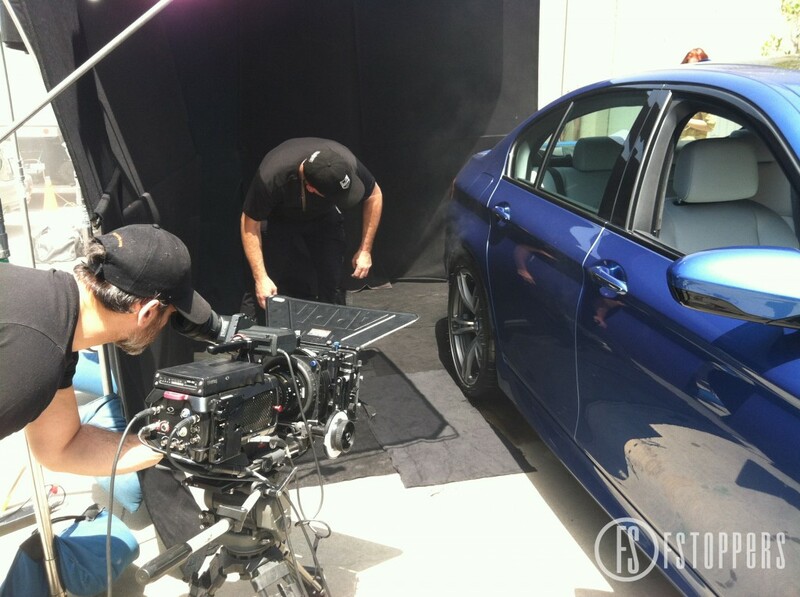 They needed to recreate the environment digitally from Glaser’s footage taken on the Salt Flats, adjust the reflections on the apple, balloons, and car in order to mimic a sun, and fully render the BMW M5 digitally. 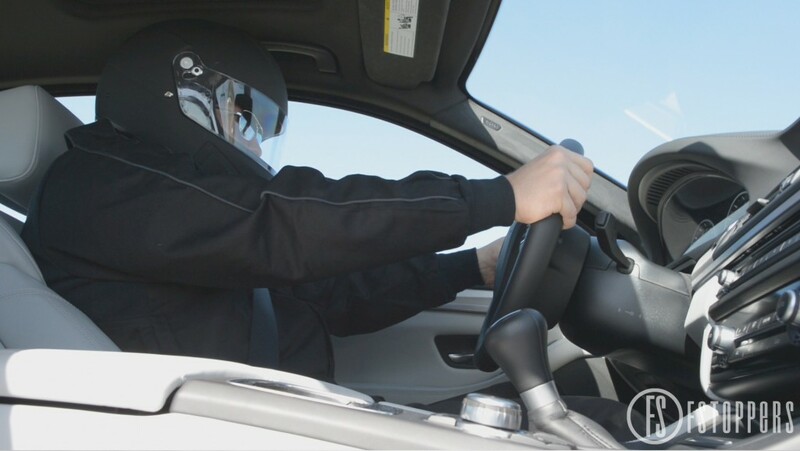 In the end, the only parts of the car that are real were the audio and the interior shots with the driver shifting into gear. With all the footage ingested, the digital rendering complete, and everything edited together, Glaser and Big Block had created something truly masterful. They managed to recreate an environment and a car, a monumental achievement on its own. But they didn’t stop there. They put that car through the environment in a truly believable fashion, and then they smashed it into stuff. My guess is that most of you thought that CG was involved in some way, but I would wager not many of you thought that the CG would be of the car and not of the apple, balloons, or target. 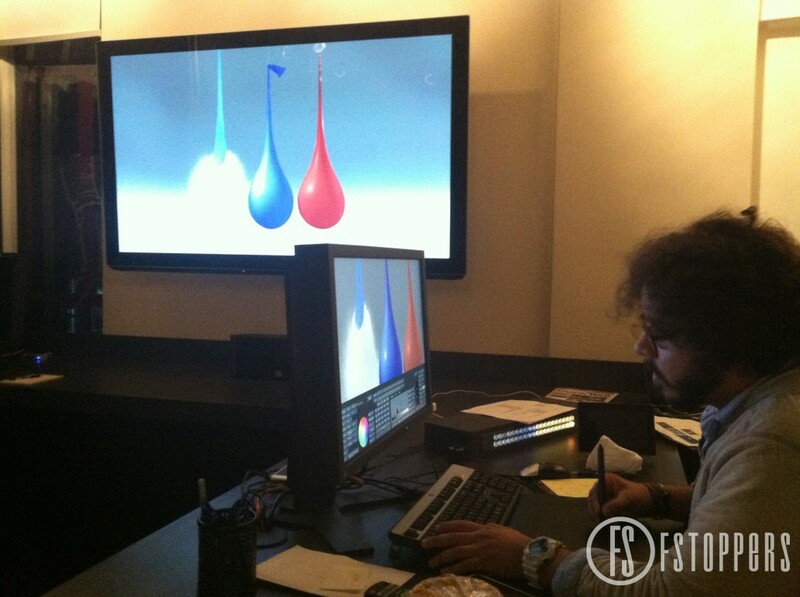 The film was a collaboration between Big Block and the ad agency. Glaser and team plan to release a “director’s cut” version of the commercial soon, which shows their own version of the film. As soon as it is available, you can bet you’ll see it here first. As a Los Angeles based photographer and commercial director, Marek initially developed his eye at a young age exploring photo-realistic oil painting. He was also a very early adopter of digital art, particularly 3D rendering, which taught him a lot about lighting. Going form simulating light behavior in a computer to creating and capturing real light through photography has become his obsession. Marek lives in Pacific Palisades, California with his girlfriend and creative partner, Emily Balay, who specializes in hair and makeup. 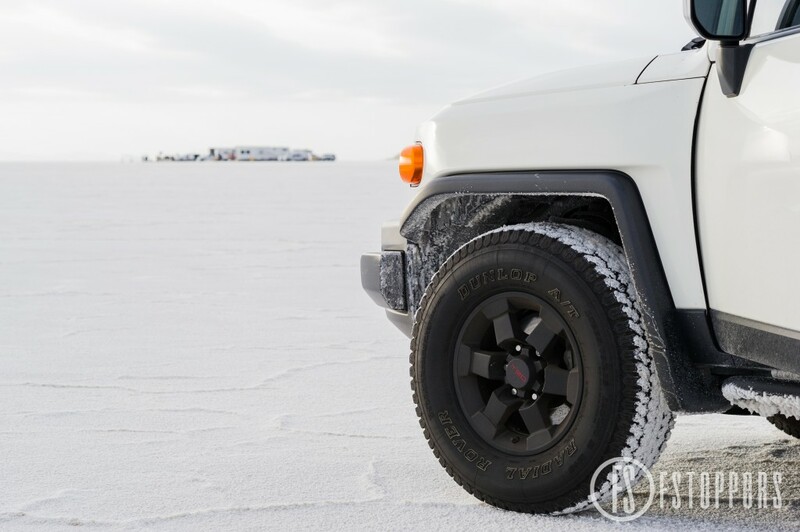 Launched in 2011, Big Block is a digital production studio specializing in digital automotive content, VFX, design and finishing for feature films, television, commercials, gaming, interactive, branded online content and mobile platforms. The studio is home to an award-winning production and creative team. 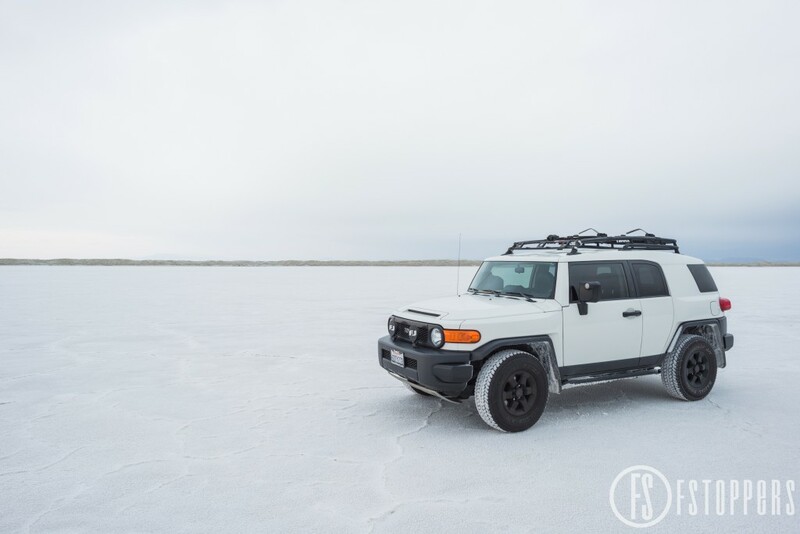 A key component of Big Block’s car-centric focus is our software development group, which generates new techniques to extend and evolve our production capabilities across the creative landscape. A prime example is our driving simulator, a proprietary driving simulation software, which parallels the physics of driving in real time 3D and allows virtual cars to seamlessly interact with live action environments. Great execution, though I can't help but think that the entire commercial looks real and not "conceptual" at all. I was expecting to see how they shot it, and then discovered it's CGI. Disappointing. They should have hired the BBC UK Top Gear team for the stunt setup. They've driven through a brick wall in a past episode. wow,... inspiring. 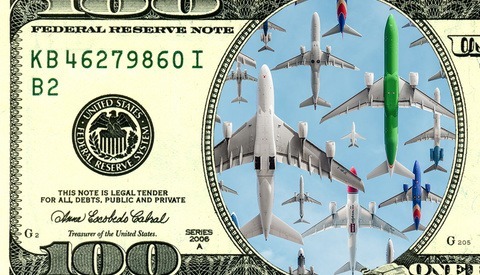 Is there any mention how much the cost production for this project? How do you record 32bit images on Nikon D3s? Exposure fusion using bracketed exposures. I like to use a piece of software called PTGui for that purpose.